John Kasich is back in the media spotlight this week, touting his campaign reflection, Two Paths: America Divided or United. He was in Cambridge on Wednesday, giving a talk at the Harvard Kennedy School and signing books at the Harvard COOP. Grace and I went early enough to get a picture and briefly chat with him. The event organizers explicitly told us all that we weren’t supposed to talk or take pictures (“only from the line”), but as I suspected and saw for those ahead of us, Kasich wouldn’t have had it any other way. When I first found out about this book about a month ago, I immediately pre-ordered it on Amazon. It finally arrived on Tuesday; I read the first three chapters before the book signing on Wednesday, and I just finished reading it last night. 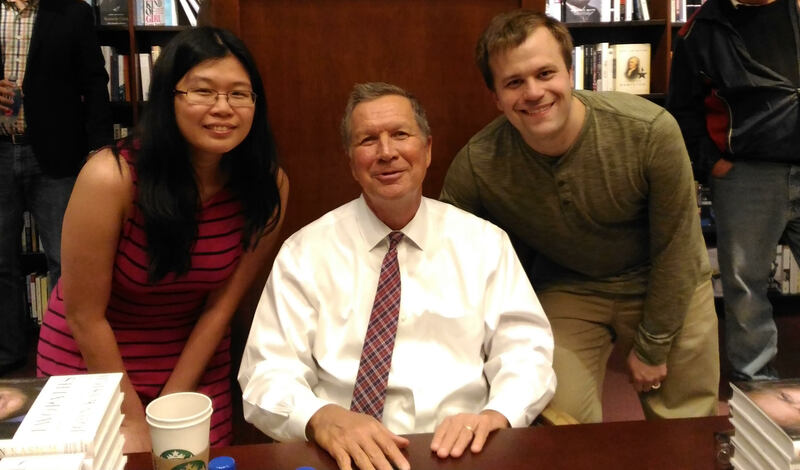 This eagerness probably doesn’t surprise many of you since my pro-Kasich blog post back during the primary season, but I was really curious to hear his perspective on the campaign from the inside. I also thought it’d be helpful to others to review it this early, hence why I made sure to finish it in time for my post this week. Even though I was intending to read most of the book in one evening, this was no chore; the book is very readable. Kasich peppers humorous little asides and jokes throughout his stories, and I found myself getting Grace’s attention to read those to her. The humor also in no way detracts from the gravity and sincerity of the message, which ends on a solemn note of a letter written to his two teenage twin daughters. Coming in, I was expecting more from the book than simply a play-by-play rehashing of the campaign. I’ve shared the story of my favorite baseball team, the Arizona Diamondbacks, rallying to beat Mariano Rivera and the New York Yankees in Game 7 of the 2001 World Series so many times that it’s been etched into my memory. But I wouldn’t go to the effort of writing a whole blog post about it, or even the book written about it. (If I some day do write such a post, that’s when you know that I’m scraping the bottom of the barrel!) But Kasich’s message is far more important. And the book is all the better for it. I think this is why there has been so much interest — Governor Kasich might be best known for not endorsing Trump and not showing up at the convention as the governor of the state where it was held, but what people are really wondering is, why? What principles is he standing on, that no other Republican seems to have been standing on? Clearly it wasn’t personal for him, either. By setting the stage with this example, Kasich makes it clear that his principles stand on their own, and he defends them in the book above and against all other politicians, not only Trump. To reiterate, this book is not about Kasich needling Trump — although he doesn’t pull his punches when appropriate, he really intends to indict the entire American political system, both leaders and followers. Think about it: Why did Kasich continue his campaign for so long, even though he had very little success (famously, only one win in his home state of Ohio) to show for it? For those who weren’t following the campaign, the common mental image seemed to be that Kasich was simply being stubborn, refusing to leave the race when he had no chance of winning. But then, that really is a surprising thing, isn’t it? How could a campaign sustain itself with only the bare minimum of electoral success? Wouldn’t everyone involved just want to quit? No, it’s not that Kasich was simply more stubborn than Bush, Rubio, or the whole lot of them, or, cynically, that he was simply looking to sell more books by being able to accurately describe himself as the last survivor against Trump. His supporters, team and family believed in him throughout his run, and could see the message that he was spreading around the country taking hold. As he held bigger and bigger town halls from state to state, his campaign was growing in momentum, even if that didn’t translate to the TV audience. Far from simply complaining about the coverage, though, Kasich goes on to tell Emily’s story, of how she realized, partly through this episode, that TV journalism wasn’t for her and went to Yale Divinity School instead. Even though it’s essentially a campaign autobiography, Kasich doesn’t primarily write to try to defend or justify himself. For a politician, there’s a surprising and refreshing lack of self-righteousness in the tone; you can tell that he’s dropping names to thank people, not to brag. Having written so much about what this book is not, I bet many of you are wondering by this point what it is. What is this gospel that John Kasich was so eager to cross the country and write a book to share? It’s hard to articulate the message briefly, but I’ll try to do so and then share a lesser-known story at the heart of how the campaign itself transformed his sense of calling. Our country is going through a lot of pain, with economic hardship piled on top of social isolation leading to the anger, fear, and post-truth environment we saw vividly on display this election season. But we don’t truly find satisfaction in this base level of our reality; we need to transcend. Kasich draws from his Christian faith to help him recognize and respond to moments of transcendence, like random acts of kindness, but he thinks transcendence is possible from other points of view like humanism. It’s when we take our eyes off our transcendent hopes that we end up embracing a strongman like Trump. There was snow on the ground, and folks seemed to be settling in to the idea of another long, cold New England winter. And I guess I was feeling a little nostalgic for a time in our lives when neighbors came together at that time of year and made sure everybody had what they needed. This was my mind-set as I addressed this collection of friends and neighbors in New Hampshire’s Great North Woods. While I had their attention, I just happened to ask if anyone in the hall that day who’d been married a long time had recently lost a spouse. I knew there were probably a few people in attendance who lived alone, and that it’s always tough being alone over the holidays. The question just came to me — it was just something to ask, given the way our “conversation” had been going up to that point. I share this story from the book because I hadn’t heard it before, even though I’d seen and shared the subsequent viral video of a young supporter named Brett Smith who was going through a rough time asking for a hug. Characteristically, Kasich spends his time in the book on “The Hug” allowing Brett to share how people on the street recognize him and ask how he’s doing, and all of this attention has actually made it easier to bear. In a world where going viral tends to massively distort people’s lives, it’s a refreshing postscript to an already heartwarming story. To Kasich, the people who he met during the campaign are not just props, but truly special individuals worthy of our attention. While it’s true that much of his campaign’s attention and success was a reaction to the backdrop of negativity coming from the other campaigns, it was no accident that this grassroots movement found its leader in John Kasich. In the same way, this book and his tour around it are pretty clearly not intended to lay the groundwork for a future run. Kasich is simply not a cynical, calculating politician like that, as the book makes abundantly clear. When the journalists ask, he’s clear that he isn’t ruling a future run out, but he’d need to feel a distinctive calling again. Rather, his overarching intention through this book and the accompanying media attention is to give voice to this message of connectedness that caught on through his campaign, and to thank the people who were involved in spreading that ray of hope in an election season of despair. Having watched dozens to hundreds of his interviews and speeches, I could easily tell that this book was written by Kasich. If you love his somewhat rambling story-telling style, you’ll appreciate a book that describes how he discovered his purpose through the 2016 campaign, weaving his narrative and perspective. Conversely, if you found yourself during the campaign wishing he would just get to the point more succinctly, you will likely not have the patience for a book that repeatedly cuts out from the action to discuss some more general issue on his mind. But most of you probably hadn’t heard his message, even if you paid general attention during the campaign. Those are the people who will find the book the most helpful, since he articulates a vision for the country that cuts to the heart of why so much of our politics just doesn’t work. As the right starts to sour on the lack of accomplishments of the Trump presidency and the left turns to straight-up mockery, we need someone like Kasich to help us transcend it all, to bring us hope.